Add those final touches to your perfect Halloween Haunt with our amazing Halloween Artwork. 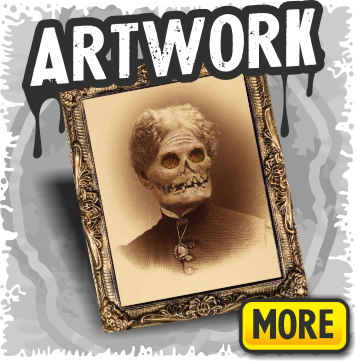 Between our Holographic Portraits, Creepy Gothic Pictures, Clings, Banners, and even Spinning Haunted Portraits, we here at Halloween FX have got just the Halloween artwork you are looking for to fulfill all your haunted house needs, and at prices that are unbelievably low. If you are into scary movie characters, we've got some excellent Halloween Artwork that is right up your alley. Check out our clawing Freddy Kruger, slashing Jason Vorhees, and nightmarish Hellraiser and Pinhead scene setters, clings and pictures to set up that killer movie room. Or, for the little ones, you can always use our Haunted Forest Backdrop, add a Hogwarts banner, and one or two of our moving Hologram Pictures and and bring the magic to life right before their eyes! Having a very large Halloween Banner will accompany your haunt beautifully, and since they are so affordable - some are as cheap as $6.00! - you can have each room of your haunted house covered floor to ceiling in our highly-detailed Halloween Banners. Everyone will love the attention to detail that you have put into your haunt, when you use our huge selection of Halloween Artwork. If you are a big fan of horror movies, you don't really need an excuse to keep our killer Halloween Banners up all year long. Or if you are into forests, fairies, and nature scenes, then our Haunted Forest Banner is just the thing to cater to your haunting aesthetic. Not everyone enjoys putting on a gory and blood-soaked haunted house. Some of the most unsettling haunted houses are the ones that allow your guests' imaginations to do the work for them. You can create this haunting effect simply by placing a few pieces of creepy Halloween Artwork around your haunted house. Turn up the fog, dim the lights and place a few of our amazing, small, high-powered, colored spotlights in your haunted house. Then add a few banners and sight-altering Holographic Pictures to the mix and you will have a haunted house that will freak out even the most die-hard Halloweeners! For the perfect proven, tried-and-true skin crawling effect, you must add a few of our Hologram Pictures to the mix of Halloween Artwork you set up in your haunted houses. All your guests will have to look twice as they walk by these Holgram Pictures and experience the mind-altering changes they make. Ever since these wonderful Hologram Pictures came out on the Halloween market, people have flocked to buy them and they have not lost their popularity since. You can have these unbelievable pictures throughout your haunted house for a whole lot less than you would imagine. Most of our creepy Hologram Pictures are only in the $50.00 price range, and we carry everything from well-dressed men that turn into demons, to distinguished gentlemen that rot before your very eyes, and pretty little girls that suddenly turn possessed. So add a few of our Hologram Pictures to your Halloween haunted house, and you will see just how much Halloween Artwork can turn the ordinary to extraordinary!